Former Houkago Princess members Chiba Sakino, who graduated the group on July 21st, and Noda Hitomi, who was dismissed on September 10th after she had been caught contacting a fan, made an appearance at Ikebukuro WHITE BASE on September 28th as SakiHito. There, the girls performed and made a special announcement regarding their desires to resume idol activities. During their performance, the girls announced that they would be a part of a new group called READY TO KISS. 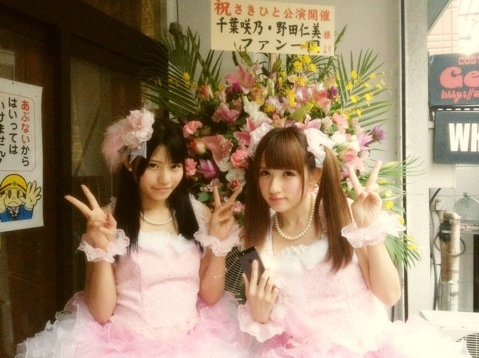 There will be six members, including Hitomi and Saki, who make up the group. 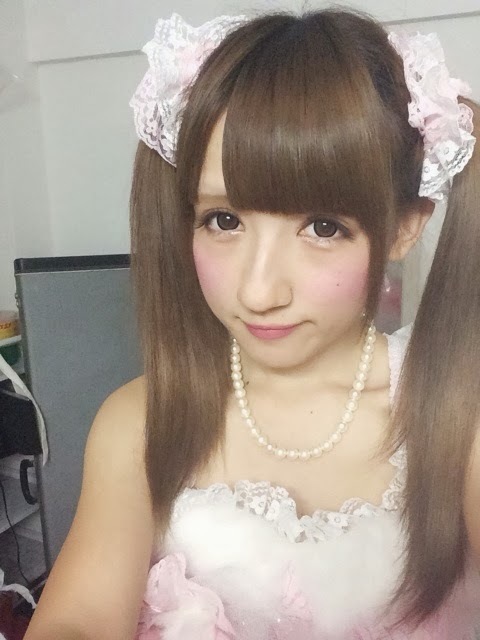 The sixth member is Ichinose Anju, and currently I am unable to find images of her or even information about her. However, the interesting thing about READY TO KISS as a unit is that almost all members of the group are former 'students' of Houkago Princess (that makes life easier for me, because I have their profiles already. YAY!!!) so most of them already know each other and have already worked together. The group are under Get Crazy, a company that specialises in made-for-order costumes (it explains why Saki is under the label, as she wants to go into fashion) who have previously worked with Houkago Princess. The group aims to go on as the six members that they are right now, so please support them! Currently, SakiHito have an official website and twitter. Nagafuji Aoi has a new twitter that fans can follow as well. (I forgot to comment on that article with my anger over the issue, but yeah, I was pretty ticked). I guess it is? That, or they just came together for a performance because they were two original and popular members of HouPri, so they thought it the best way to promote the new group. If they are a sub-unit though, I'd be happy! And Hitomin is my favourite HouPri member, by far, even after her supposed 'scandal'. I understand being ticked, it's annoying when they do that to girls for contacting people and such. Urgh. I actually hope this group produces songs and PV's, but for now we don't know. HouPri themselves are pretty obscure, and this group are even more obscure than they were before... but I'm gonna be hopeful and pray they aren't just a performance unit. Just to quell all the rumours before they get out of hand and become indisputable facts - no, I am not the mastermind behind this, though it pleases me immensely to see that the girls haven't given up on their dreams and are instead chasing them down like a boy they've got a crush on. If ever they need someone to write them a hit* song, I'd be proud** to contribute. ** pride absolutely 100% guaranteed! Why is the hit status not guaranteed? This is your song ;w; You awesome <3 HIT GUARANTEED!!! Congratulations, Chiima, you have won the highly coveted Best Believing In Sonda Award for 2013! *balloons* *streamers* *fanfare* *dodgy bowling trophy looking thing* Reading your praise makes me feel sooo <3 It was rainy out today but you wouldn't know it because I'm BASKING IN THE SUNSHINE here at O!MT ! Can you believe some OTHER mastermind beat me to the punch? The gall! Really, I had no idea the mastermind market was becoming so crowded but.. those woes aside, at the end of the day what matters most is it's a win for the HouPri outcasts and a rigid middle finger for them what did the outcasting. I so badly want them to succeed now. And if I wrote a song for Ready To Kiss I guess both you and I would know that it's a hit, but convincing the music buying public is entirely another matter. Hmm... maybe if we slap an a, k, and b somewhere in the title it might help. Couldn't hurt, right? I know, how DARE that other Mastermind!? Very rude of them, to be honest! But yes, sadly, the Mastermind market is in high demand now, and it is a Dog-eat, Dog-world there... urgh. But yes, it is a win for HouPri, and I am happy to see Hitomin and also Rena (I recently found out she was dismissed for doing indecent things, what they were is beyond me) in this group! They are having a concert/live debut soon, so yay!!! I want CD releases, but I think they are more fashion orientated. It's a little amusing that they started their group under the same company that HouPri had their theater performances at.